I AM one of those who have had little alternative but to get rid of my boat, thanks to having hardly anywhere to take it, writes Arnold Rhodes. This is because I was unlucky enough to be trapped on the Leeds & Liverpool Canal for the length of the holidays, with only a few miles one way and none the other as no winding hole to turn my 58ft boat. The photo shows a Bank Newton lock. 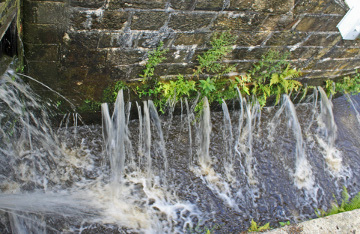 Some said it would only happen the once due to little rain, but I have just read that at the end of next week that's it again until next year for any serious boating on the Leeds & Liverpool Canal, and it is the same excuse as last time of little water available, but I have been taking photos of the locks of the canal and you can clearly see that it is not so much as little rain but big leakage. I have been hiring and owning for 27 years, and can tell you that in my early hiring days it was most unusual to come across a leaking lock gate, but as time went on and particularly in the past few years it is unusual not to see a leaking lock gate. 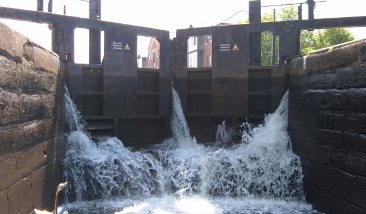 The photo shows the bottom lock of Wigan Flight. It would not be so bad if it was only this canal that suffered, for then we could escape it and cruise either the Rochdale or the Huddersfield, but as you know both suffered the same fate of lack of water so were closed, and having 'done' the Rochdale Canal last year I can vouch for that, as I was caught in the summit being closed through lack of water. As for the Huddersfield Narrow, none of us risk that these days as it is closed for one reason or another more than it is open, and at one time they allowed a ridiculous time from opening the lock in Huddersfield and expecting you to reach the tunnel, that was impossible to do owing to the sheer number of locks to negotiate, but I don't expect who ever thought up that scheme knew how many locks there were. 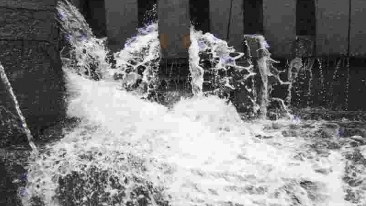 The photo shows the leaking lock sides of the lock recently closed as it was leaking. Another problem with the Huddersfield is the lack of dredging, for with so many locks having such short pounds being so close together they leave boats stranded on the mud should there be more than one boat using a nearby lock. Coupled again with leaking gates, cruising this canal is very hit and miss indeed. It is a great pity about these canals being closed so often, as crossing the Pennines as they do they are the most attractive of the lot. Another great pity is that we have someone like Canal & River Trust in charge of their maintenance, the real source of the problem.